Throughout the Dukan Diet you can enjoy a carbohydrate respite in the form of a tablespoon of oat bran every day. Oat bran is rich in sugars and protein, but its benefit lies in the high levels of soluble fiber, which absorbs water in the gut, swelling up to 20 times its size. This helps you feel full and satisfied. It is also great for heart health and eases constipation (which can affect people in the early stages of the diet). But once digested, it attracts fat molecules, sugars and toxins, and carries them out of the body before they can be absorbed into the bloodstream. Oats contain high levels of dietary fiber, manganese, selenium, and magnesium. Numerous studies showed that a diet high in beta-glucan from oats help to lower blood LDL cholesterol (the bad cholesterol). Oats may also help stabilize blood glucose levels, which may benefit people with diabetes. Studies show that in people with high cholesterol (above 220 mg/dl), consuming just 3 grams of soluble oat fiber per day typically lowers total cholesterol by 8 to 23 percent. 3 g of soluble oat fiber can be found in just one bowl of oatmeal - it can be that easy! In 1997, the FDA authorized coronary heart disease risk reduction health claim for beta-glucan soluble fiber from oat products. To qualify for this health claim, a food product must contain at least 0.75 grams of beta-glucan soluble fiber from oats per serving. Food products containing oat bran and rolled oats, such as oatmeal, and whole oat flour can bear this health claim. In addition to beta-glucan soluble fiber, oats also contain avenanthramides (a type of antioxidants). Preliminary studies showed that avenanthramides help prevent free radicals from damaging LDL cholesterol. Oat bran is an essential part of the Dukan Diet because it makes following the program easier. Oat bran expands up to 30 times its original volume when it comes into contact with water or other liquids in your stomach. This slows down digestion while helping you feel full. Another advantage is that oat bran is sweet and it can be incorporated into your diet in many different ways. It absorbs calories from other foods during digestion which are then eliminated through bowel movements. Although you won’t reduce your calorie intake enormously this way, if you eat oat bran regularly, the cumulative effect can be significant over time. Oat bran aids in healthy digestion, which can help counter constipation or irregular bowel movements, a common side effect of any weight-loss plan. It is inexpensive, and helps to prevent diabetes by slowing down the speed at which sugar is absorbed into the bloodstream. 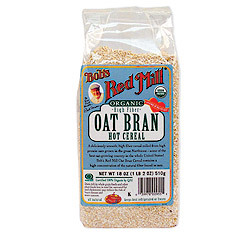 Oat bran also plays an important role in cholesterol reduction and the prevention of colon cancer. No other food offers the same health benefits.